Are you tired of uncooked pasta and the mess that comes with cooking it in a standard pot? Well, we got you covered. Based on carefully selected criteria we’ve tested and reviewed the 10 best options for pasta cookers on the market. Now it’s up to you to decide which one to get for your kitchen. When you think about pasta your mind automatically starts to envision different colorful pasta dishes. A pasta cooker is an attractive feasible solution that helps you prepare the most delicious dish – “Pasta”. Pasta can be cooked using several recipes and provide wonderful tastes, but the core ingredient it’s the pasta itself. Thus, proper pasta cooking is the key to success. Yes, this is indeed the original and the famous Fasta Pasta. The makers of this pasta cooker take pride in this product saying that it is a revolutionary new way to cook pasta in the microwave. The main selling point of Fasta Pasta is that it can cook perfect al dente pasta every time. There’s no risk of overcooking or undercooking your pasta, like it often happens with conventional stove top pots. You also don’t have worry about the water boiling over the top and making your kitchen smell like burned pasta all day. The cooking process takes a lot less time and a lot less effort than in the standard pots. Just put it in the microwave and you’ll have yourself a meal in no time. Another great thing about Fasta Pasta is that it doesn’t take a lot space in your kitchen. It’s compact and lightweight, and can easily fit in any microwave. It weighs only 12 ounces. The plastic container also features measuring holes and a strainer, adding an extra layer of convenience to pasta cooking . This pasta cooker is inexpensive and affordable for everyday users. Fasta Pasta is definitely famous for a good reason. Best pasta cooker all around. Here’s one great product by Winware. The special thing about the Winware pasta cooker is that it has 4 stainless steel inserts, allowing you to cook 4 different types of pasta or vegetables at the same time. Winware 20 Qt is not too heavy but still big enough to contain a lot of pasta. This is made possible by the aluminum construction of the pot. If you want to prepare a pasta dinner for a family gathering or a party, then this is the best pasta cooker for you. The pot can take around 18 liters (20 qt) of water, which means that it can cook a whole lot of pasta at onc. The specific thing about this pasta cooker are the previously mentioned inserts. They enable you to cook 4 different types of pasta or vegetables in one go. This will save space on your stove for other things, since you don’t have to have 3-4 pots on it. You can just do everything at once with this amazing item. The inserts are made from stainless steel, therefore no worries about them getting rusty or damaged. Bit pricey, but worth every penny. One of the best pasta cookers if you want to cook a lot of pasta and have a versatile multitool on your hands. Features 4 insets that enable you to cook 4 different types of pasta or vegetable in one go. Inserts are made from stainless steel and they won’t rust. Inserts feature handles on top, so you can easily drain the water. Winware pasta cooker is a bit heavy, but not too heavy to handle. Another stovetop pasta cooker, but this time a bit smaller. Smaller doesn’t mean worse though. Some might prefer more compact pasta cookers like this one. It’s lighter, you can fit it anywhere, especially useful if you have a small, compact kitchen. This stovetop set features 4 different parts: 8 qt stock pot, pasta insert, steamer insert and a tempered glass lid. The pot handles heat well and distributes it equally. This is due to the aluminum core on the bottom of the pot. On the side you’ll find riveted handles that are extremely sturdy and heat resistant, so you don’t have to worry about burning your hands while handling the pot. The sturdiness of the construction enables you to wash this appliance in a dishwasher without the fear of it breaking apart mid wash. Just put all the individual parts inside the dishwasher and you are good to go. This is definitely one of the most affordable pasta cookers on the market. If you want something that’s sturdy but still lightweight, then this is the best pasta cooker for your money. Multipurpose - Additional parts, like the steamer, enable you to steam your vegetables in this pasta cooker. Here’s another microwave pasta cooker. This one is brought to you by a company with an interesting name – Pasta Boat. Pasta Boat’s cooker is small enough for you to use in any microwave, but big enough for you to cook sizeable portions of pasta. It also comes in a stylish red colour. Pasta Boat can hold up to 5 pounds of pasta. That’s a lot of spaghetti, noodles or veggies. It also comes with an in-built strainer lid and a steamer rack. Steamer rack will enable you to cook some delicious vegetables as well. On the sides are sturdy handles that resist heat, so you shouldn’t worry burns while handling the Pasta Boat. Pasta Boat will cook pasta evenly, without it coming out sticky, undercooked or overcooked. Basically, you’ll get perfectly cooked pasta every time. The cooking process is fast, just put it in a microwave and you’ll have yourself a meal in no time. Added benefit of the microwave cooking is that there’s not a lot of mess, so a lot less to clean after you meal. You can also safely wash it in a dishwasher. Really cheap and affordable pasta cooker. If you are looking for an affordable option in pasta cookers, then this should be the best pasta cooker for your needs. Another Progressive product, this time a pasta cooker. Progressive already proved themselves as a capable company that delivers quality kitchen tools. So what’s so special about this pasta cooker? Let’s find out. First thing you’ll notice is its red and white stylish colour. That doesn’t matter much, but what matter is the size. It’s a bit bigger, perfect for cooking a lot of pasta. It has a capacity of 12 cups. And pasta isn’t the only thing you can cook inside this pasta cooker. You can just as easily cook rice, as well as vegetables with the steamer insert that comes with this model. Other things you’ll get are the serving paddle, measuring cup, steam insert and a drain insert. Basically, additional inserts that will serve your every pasta cooking need. Each of these parts are very sturdy, so is the base cooker and they can be safely washed in a dishwasher without the fear of it breaking inside the wash. This pasta cooker is very affordable. This model is definitely one of the best pasta cookers on the market. Does what it’s supposed to do, and does it very well. This is another product from the famous Fasta Pasta brand. This pasta cooker is a lot similar to the first one we reviewed, except it can cook larger portions of pasta in an impeccable manner. This version of Fasta Pasta will cook the perfect al dente pasta every time, and it will cook a lot of it. It is intended for 8 servings. With this pasta cooker you can make meals for a party or family gatherings without the risk of overcooking or undercooking. You don’t need to worry about the water boiling over the top and making a mess of your kitchen since the cooking process is safe and clean. Even though it’s a bit bigger, it can still easily fit in any microwave. It weighs only 15,2 ounces. The plastic container also features measuring holes and a strainer, adding an extra layer of comfort to pasta cooking. This pasta cooker is a bit pricier, but still on the cheap side. The family size Fasta Pasta cooker is the best pasta cooker for those who want to cook a lot of pasta in one go. Measures are kind of hard to read. This four piece pasta steamer is the perfect equipment to have, especially if you have a large family to feed. It’s exclusively designed aluminum base provides excellent heat distribution. It’s quite versatile and easy to use. Moreover, you get a fantastic flavor-lock lid for a healthier meal and steam cooking. All the pieces are sturdy, and their overall quality is excellent. Also, another great thing about this cookware set is the fact that each and every piece fits perfectly into the dishwasher. Excellent price when considering the quality/value ratio. This product comes with a 12-quart saucepan, a steamer basket, a stainless pasta insert and a stainless lid. It has everything you need to cook a homemade family meal for your entire family. 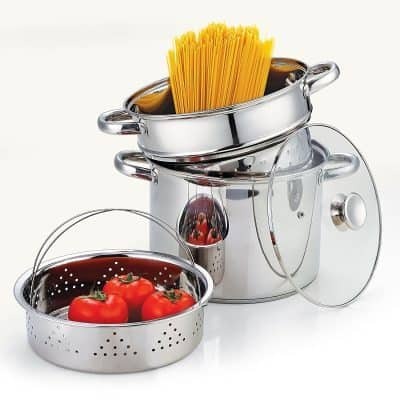 This pasta pot is made 18/10 stainless steel, and we see it as a great bargain for what it has to offer. This pasta cooking set is not just an ordinary pot for cooking pasta, you can actually cook a large variety of meals with it. For instance, you can cook a multitude of vegetables, including asparagus. So, if you’re feeling a little adventurous you can try and cook any kind of dish you want, with any kind of vegetables. Moreover, it sports a unique silvernox surface treatment which can improve the resistance of the stainless steel. It can also cope with the most aggressive detergents, which will not damage the material. Best of all, you get a 30-year warranty with this pot, which we find extremely useful! The price is very acceptable for the quality you get. For anyone looking to have a functional yet versatile pasta cooker, this is the number 1 pick! This multifunctional tool should have its place in every kitchen worldwide. For starters, it comes with an attractive price, a real bargain. And like we mentioned before, it’s a multifunctional tool, which means that it can cook, strain, and store pasta in just one bowl. It also comes with an extender ring which allows you to steam a second type of food. Another great feature is the fact that the strainer lid can drain the pasta without using a separate colander. Moreover, if you decide to buy this multifunctional tool, as a bonus you receive a cookbook that has 50 recipes in it! All in all, for all the things it does, its price and the fact that you get a free cookbook, we consider this one a great bargain. A great multifunctional product worth every penny! This pasta pot is a stainless steel multi-cookware that you can do a lot with. Before we get into its functionality, let’s talk about its overall appearance. Like we mentioned before, this is a stainless steel multi-cookware with an encapsulated base, and it’s quite durable. We also like its simplistic design. With this tool, you can cook, strain and store your pasta, very easy to use and not to mention the fact that it’s even easier to clean and maintain. The price is a fantastic bargain, you get an appliance that is not only cheap but made of stainless steel, so you can consider this one a steal! This multi-cookware is ideal for every kitchen, and best of all, it is dishwasher safe. Since pasta is consumed all over the world we made sure to pick only the best products available online in order for you to make a quality choice when picking one. Before selecting these products, we have engaged a number of experts who performed several tests on a number of cookers popular among users. These tests have been based on a set of criteria for evaluation focusing on the quality of the appliance in general. Generally speaking, when choosing a kitchen appliance the first thing to consider is its material. When it comes to pasta cookers, there are three most common materials used in its manufacturing. These materials are related to the type of appliance. If we are dealing with a countertop stove pasta cooker the base materials are aluminum and stainless steel. Whilst, if we are speaking about a microwave pasta cooker, then plastic is the most frequently encountered material. Needless to mention the fact that there are a certain types of materials that can have a risky interaction with food during the cooking time, and that is why customers should search for additional information in regard to materials used. For instance, when looking for a microwave pasta cooker, make sure the plastic type is BPA free and approved by the related authorities. During our selection phase we’ve paid attention to a lot of standards. First of all, when dealing with a countertop stove pasta cooker, our experts tested the bottom layers in terms of stickiness. The best stove pasta cookers have a non – stick layer that ensures a prompt and easy release of the food. Another important element of the stove pasta cooker is the ability to distribute temperature evenly. Aluminum and stainless steel are widely accepted as the best materials in terms of heat distribution. The device lid is another important element. Certain types of pasta cookers are coming with a hole design lid that facilitate the water discharge once the cooking process is finished. When it comes to the microwave pasta cooker, then we are talking about plastic materials. The best plastic materials are those evaluated as BPA free. This type of plastic is considered as a healthier choice. The microwave pasta cooker comes with a lid too, but usually the lid is being used only to discharge the water and not during the cooking process. Both countertop stove and microwave pasta cookers come with a set of extra parts such as the steering spoon, straining lid etc. Most pasta cookers are not electronic appliances. They work by utilizing energy from the microwave or the countertop stove to boil the pasta water. Considering this, we have to highlight that the performance of these appliances is strongly related to the temperature setting and the cooking time you set. One of the most important aspects of a pasta cooker’s performance is its durability. The best pasta cookers should be resistant to heat, regardless of the type (countertop stove or microwave). The countertop stove pasta cooker for instance needs to have the relevant shape that allows the pasta to fit in and avoid unnecessary steam to be released outside of it. Microwave pasta cookers are considered to perform well when the design allows the microwave rays to evenly reach and cook the whole pasta portion. Another common element in terms of performance is proper release. Both types of these appliances should be manufactured with the necessary protective layer that will prevent sticky incidents. When we go the market looking for a new kitchen appliance we are subconsciously focusing on the ease of use. Generally speaking, nobody likes complexity when it comes to daily routine stuff. We are always looking to buy things that will make our lives much more easier and convenient. This also applies when searching for a new pasta cooker. We’ve mentioned at the very beginning that pasta is cooked following different recipes. Thus, we might face the necessity to add a few herbs to our pasta during the cooking time so having an ergonomic top lid would provide a great cooking experience. As for water discharge, this is one of the most problematic and worrisome issues people are faced with when making pasta. That is why most of the pasta cooker providers are highly focused in designing a practical unit shape that can make water discharge much more convenient and less messy. As far as weight is concerned, countertop pasta cookers are the topic of discussion. Since they are made of stainless steel or other metal type, they are relatively heavy compared to microwave pasta cookers. However, continuous testing and the focus on customer satisfaction has made it possible to tailor these appliances to the customer’s needs. Plastic/ silicone handles for instance are considered to be really helpful when moving the appliance from one place to another or during the water discharge process. As far as washing is concerned, both countertop and microwave pasta cookers come as dishwasher safe. This means that the user wouldn’t have to bother about manually washing them after the cooking process. The cleaning products that can be used to wash the pasta cookers are usually mentioned in the unit instruction papers. Since they are mostly considered as dishwasher safe, users can use dishwashing machine tabs as a good option. Although we mentioned that pasta cookers generally come as dishwashing machine safe, you need to pay attention to the instruction papers. There might be cases when you should manually handle their cleaning and washing. Countertop stove pasta cookers, for instance, may be equipped with a certain type of silicone handle that cannot stand the dishwashing machine process. In the case of microwave pasta cooker, if you want to apply an organic solution for the odors it might absorb, you can safely apply water and lemon after the hand washing process. Product liability is another topic of discussion mainly covered in the maintenance section. Customers are always looking for a reliable vendor who can insure warranty coverage. Although the pasta cooker appliances are considered as generally resistant, warranty is always more than welcomed. In conclusion, we have made sure to review only the best items that have passed most of our evaluation criteria with flying colors. In order to help you experience a smooth and safe decision making process, we encourage you to go through our detailed description of each of the sections above as well as our FAQs. In order to make your life easier and the cooking experience more enjoyable, we are here to provide you withe the most “Frequently Asked Questions” related to the use of a pasta cooker. Q. Is it possible to cook fresh egg pasta in a pasta cooker? Yes! You can cook fresh pasta in a pasta cooker. All you have to do is follow the same procedure as with any other pasta type, but reduce the cooking time. The pasta cookers come with an instruction paper that would provide you with the necessary information about the proportions between pasta and water. Q. Can we use the microwave pasta cooker to cook quinoa? You can cook rice (both white and brown) and quinoa as well. The microwave pasta cooker allows you to cook other products similar in nature to pasta. You just have to pay attention to the temperature grading and the water levels. Q. Can we use the microwave pasta cooker to cook noodles? Yes you can. For more details on the steps you have to follow you need to check your pasta cooker instruction paper. Q. Can we use it to cook couscous? There is actually no real need to use the pasta cooker for cooking couscous. Couscous is being sold as an already cooked product. 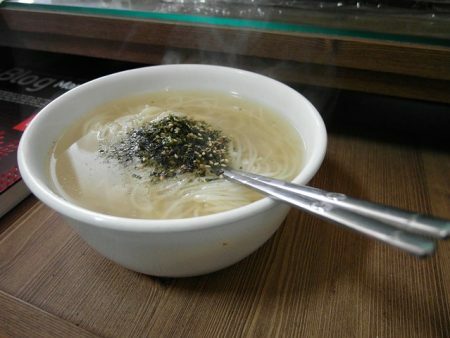 Thus, pasta cooker is not necessary. All you need to do to cook couscous is add boiling water and broth to the couscous and let it rest for a few minutes. Q. Is there any specific process for cooking macaroni or fettuccine through a microwave pasta cooker? Q. Why does the water get out of the lid during the cooking process? Why is the water lifting the lid? Most probably the reason behind this occurrence is the water level. Once you add more water than necessary it will cause excessive bubbling and lift the lid up. You can also try to cook pasta without placing the lid. Q. What is the average cooking time for cooking pasta in the microwave pasta cooker? Depending on the type of pasta, it can vary from 7 – 10 minutes up to 15 – 17 minutes. You can refer to the instructions on the pasta packaging for an exact timing. Q. Is it possible to cook gluten free pasta using a pasta cooker? There are a number of pasta cookers that allow you to cook gluten free pasta. Check instructions on the packaging for further information. Q. Are there pasta cooker versions made of ceramic or glass? Yes, there are. You can find versions of pasta cookers that are made of these materials instead of the traditional plastic one. Q. Is it possible to bake a cake using the pasta cooker? Most of the pasta cookers are being provided with a small recipe booklet. This booklet provides the necessary instructions and ingredients for all types of food you can prepare with a pasta cooker. If there is a cake recipe, then you will be able to bake it using the cooker. Q. What is the difference between a pasta cooker and a standard bowl? Pasta cookers come with measurement lines that provide the necessary levels of pasta to be added. They have been made with a specific design that provides an even cooking in the shortest time. Q. Are the plastic ones considered healthy? Most of the pasta cookers available on the market are made of BPA free material. However, you always need to pay attention whether the vendor you are buying the product from is licensed or not. Q. Is it simple to be used or is there any instruction book coming with the unit? The pasta cooker is considered to be a really user friendly appliance. It does not require a lot of experience to be handled. Most of the cookers available on the market are sold with an instruction paper. Q. Is it possible to insert two standard pasta cookers in the microwave at the same time? This is totally dependent on the microwave size. Anyways, it is not really recommended regardless of the size of the microwave. Microwave technology requires that the cooking tray is centrally positioned in order to achieve the best result. Q. Do these cookers have steaming trays/ rack for vegetables? There might be pasta cooker types that are being sold with this type of solutions. Nevertheless, steaming vegetables requires only a small amount of water, thus you can steam vegetables despite the lack of the tray/ rack. Q. How many servings does a standard pasta cooker cook at once? The standard pasta cooker is able to deliver 4 servings at the same time. You can always look for a bigger pasta cooker in case sizing is important to your family needs. Q. What is the difference between cooking pasta in a regular stove pot and cooking it in a pasta cooker? The main difference identified is the fact that you are always protected from the sticky phenomena. Also, cooking pasta with specialized cookers is believed to be more efficient in terms of cleaning. Q. Is the pasta cooker considered to be a multi – purpose kitchen appliance? Since it can be used for cooking rice, quinoa, steaming vegetables and baking, the answer is yes. If you use the appliance according to instructions you will cook all of these ingredients to perfection. This appliance is most definately a multi – purpose cooking solution. Q. Is there any risk for the pasta to get clumpy? If you add the right proportions of pasta and water, there will not be any chance for it to get clumpy. Q. Is the pasta cooked using the cover? No. The cover is used to measure the ingredients and to strain the pasta after it has been cooked. During the cooking process there is no need for the cover. Q. Is it easy to be cleaned? Is this type of appliance dishwasher safe? As far as washing is concerned, these type of appliances are generally easy to be cleaned. The pasta cooker should be soaked in warm water and sponged with soap. Then you can rinse it and let it dry. As far as dishwashing is concerned, most of them are marked as dishwasher safe. Anyways, before putting the cooker in the dishwasher, please pay attention to the instructions paper. Q. Are there any possible risks associated to using this type of device? No possible risks related to the use of this appliance have been reported yet. Q. Does the pasta cooker fit any size of microwave? Pasta cooker appliances are made in different sizes and shapes. Because of this, you need to make sure that the one you choose will fit your microwave. Pay attention to pasta cooker handles, if there are any, since they might prevent the microwave door to be closed. These were the most frequently asked questions in regard to pasta cookers. As always, we invite you to follow the respective instructions paper coming with your pasta cooker.